We attended our first baby birthday party today! One of Soren's little friends (our friends too!) was turning one, so we headed over for an afternoon of fun and food. I get to see Soren interact with other kids often, when we go to our various playgroups, but Tyler doesn't see it as much. It was fun for him to see Soren in a room full of kids and new toys. I can't believe Soren will be turning one in a few short months! I want to start brainstorming on some party ideas (pinterest has lots of great boards to browse on the subject of First Birthdays).The party today was held in a community club which I think is a fabulous idea. There was lots of room for the kids to run around and play, and best of all you don't have to worry about getting your house cleaned and organized to host a bunch of people. Our house isn't huge, which is fine for having dinner parties or small playgroups, but it would be tough to squeeze in a bunch of rowdy toddlers and their parents. I think I will look into renting a similar space for Soren's upcoming birthday. He loved the Hula Hoop! 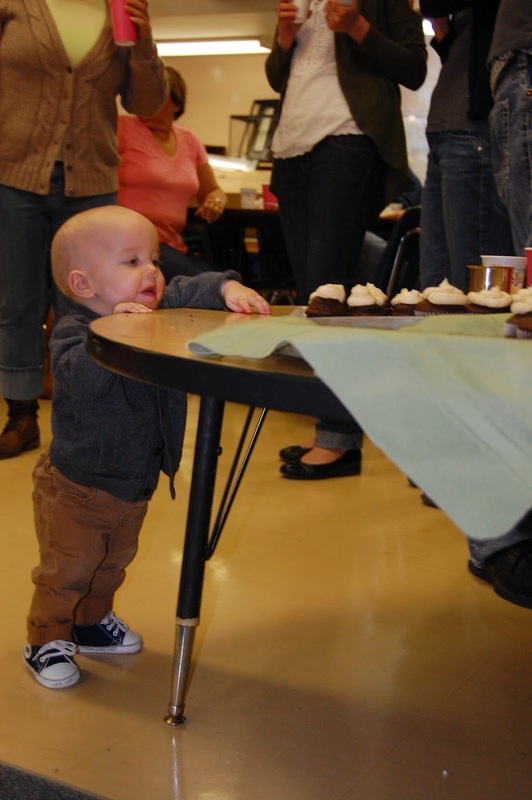 He was obsessed with all the food, but especially the cupcakes! I'm not sure why, as he's never had one before, but he crawled over to the dessert table and tried his hardest to grab one. Sadly for him, we didn't give him one. I managed to sneak in a couple and I think I saw Tyler downing some behind Sorens back... sorry buddy! One day you will get to experience the enjoyment of a cupcake! !